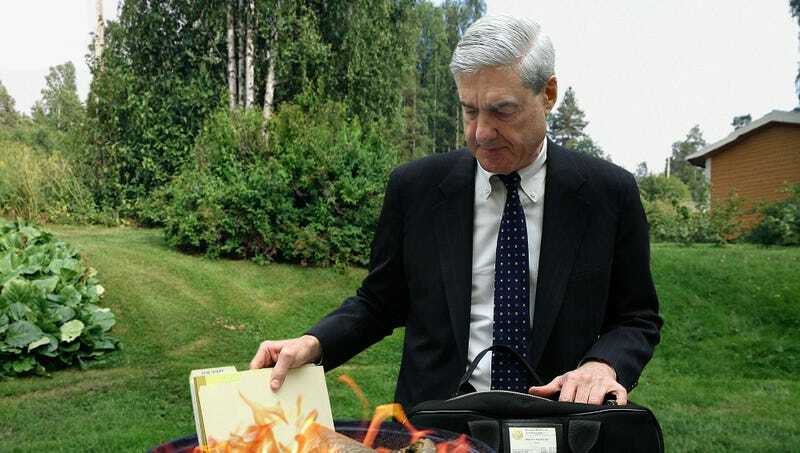 WASHINGTON—Tossing a lit match on the assemblage of kerosene-doused case files, transcripts, and seized hard drives, Special Counsel Robert Mueller burned every piece of evidence in his investigation into 2016 election interference Tuesday after hearing President Trump’s pointed critique of the U.S. intelligence community. “God, I can’t believe I’ve wasted more than a year of my life working on something the president thinks is foolish, dumb, and—worst of all—a distraction,” said a visibly upset Mueller, shaking his head as he reminded himself to drop all charges against Paul Manafort and anyone who was arrested or pleaded guilty during the investigation before feeding hundreds of pages of warrants, subpoenas, and indictments into the raging flames. “It’s a real shame because I thought I was getting close to something with those Trump Organization wiretaps, but when the president says you’re being reckless, you listen. Frankly, I just hope he takes Putin up on his incredible offer to work with the Kremlin on a more honest investigation.” At press time, Mueller’s actions had been applauded by the heads of the FBI, CIA, and NSA, who also announced plans to immediately suspend their operations pending review by the White House.